The durability of the Kong Wubba Dog Toy has blown us away. It was a good addition to Balki’s already-excessive collection. We think the Wubba’s best feature is its impenetrable squeaker. 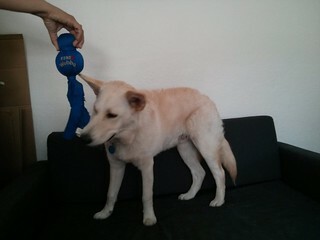 The squeaker can easily be ripped out of most toys, which is exactly what most dogs seem to do. Of course, once the squeaker is ripped out, the toy is basically useless. We think the squeaker will be one of the last things to go with the Kong Wubba, and that’s great. Despite the fact that he has spent quite a bit of time chewing on the tentacles, they are still in good shape. It’s a good toy for tug-of-war, a bit of light chewing, and the good ol’ trot-through-the-house-and-be-as-loud-as-I-can game that Balki likes to play periodically throughout the day. It is not his favorite toy, but I think it will be one of his oldest by the time it’s ready to be tossed out. We’ve mentioned in other reviews the surprisingly awful noises that can come from pushing or dropping a toy on a hard floor surface. Fortunately, this toy passes that test with flying colors; dropping and pushing it all over creation doesn’t make a peep. Overall, it was a very good purchase and recommended.